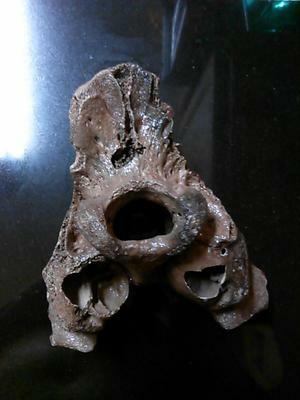 Unknown vertebrae from central Florida. Found by my father years ago in central Florida in a spring pool. Looks like the lasts vertebrae before the tail begins. 7"to 8" long.5" high and wide. Comments for Unknown vertebrae from central Florida. Boy this one has great detail. I don't know what kind of animal this was but I bet There are collectors of Florida fossils that could tell you. You might try to contact a Gem and Mineral club from that area. They have some very knowledgeable rockhounds in those clubs.